NANOPOWER Project ended. The reviewers comment is: excellent results! The NANOPOWER project has completed the third year of activity and has reached the end of the funded period. 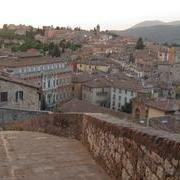 The first International Conference on Nanoenergy will be held in Perugia , Italy during July 10-13 2013. The Noise in Physical System Laboratory is glad to announce the fourth edition of NiPS Summer School devoted to "Energy management at micro and nanoscales". (The NANOPOWER consortium. From left: Clivia Sotomayor Torres, Luca Gammaitoni, Markus Buttiker, Fabian Hartman, Bjorn Sothman, Jouni Ahopelto. Professor M. Buttiker, very sadly died on 4 October 2013). The NANOPOWER project has completed the third year of activity and has reached the end of thefunded period. It was initially conceived in order to address the powering issue in microscale electronic devices and we are glad to communicate that it has been fully developed according the initial plan. The scientific objective of this project was to study energy efficiency with the specific aim of identifying new directions for energy-harvesting technologies. With this aim, three different classes of prospective power generators have been considered in a coordinated effort by the six research groups composing the NANOPOWER consortium.